Just received Pete's latest newsletter. Hey Simon - try and keep up The book was announced on MV on 21/5/16 ... where were you?! I received my copy of Ian's book yesterday, and finished it by 9.00 this morning.That is most definitely NOT a criticism. I think it nails the wonderful oeuvre. I was personally pleased to see "All The Dead Were Strangers" given a prominent place as I think it one of the most hard-hitting and no less relevant [with the passing of time] songs of the canon. I am pleased that Pete's wonderful ability to draw from all manner of musical styles is recognised and applauded [a personal fond memory is his enthusing about a tuba part in Gil Evans' "Svengali"]. I see Ian was at York sometime before me [when Pete graciously gave time to a naive "Nouse" reporter}. But what is the song drawing together insurgents and Jesus with his disciples? I know, I know, it will come back [and perhaps that's the whole point of the book!]. I'll just have to trawl through the whole bloody catalogue again.......and that's no bad thing!!!! Hi Phil -- Once you've found it (or just click here), you'll realise a happy side-effect of our preparations for Ian's splendid book: you (or anyone else) can now hyperlink to a player for (almost) any song. So you can reference a song in an e-mail, a blog or a Facebook post, and the recipient can instantly hear it -- a great promotional tool, I think. See the Discography page. Thanks, Steve. I didn't even need to pick up the phone and make a call! 'Appen I'll still trawl through the catalogue again. It's that sort of book! 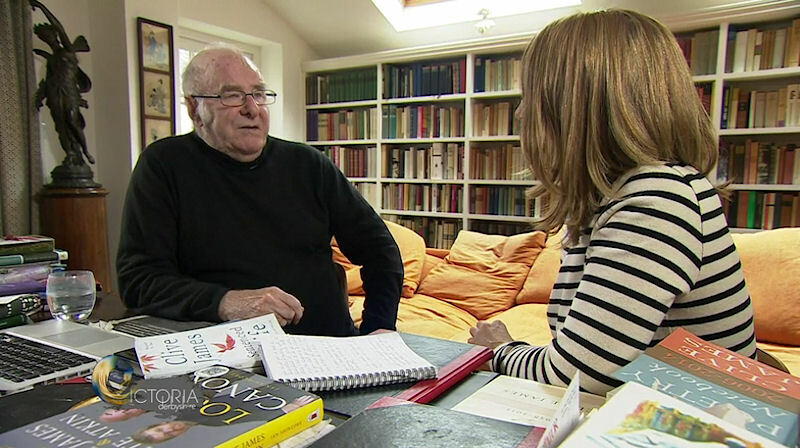 Writer and broadcaster Clive James, who has terminal cancer, has been telling Victoria about the lessons life has taught him. "I've been lucky - I've counted the whole thing as a stroke of luck," he said. And he said his diagnosis had given him "more to write about." "I can write about life now. I'm much more reflective now," he said. P.S. The reason for posting it here will be obvious to anyone who watches. I am about half-way through Loose Canon and find Ian Shircore's readings and commentaries sound, interesting, and enlightening. However, I have to disagree profoundly with his remarks on p. 100 (first paragraph of Ch. 15) on the verse in the Gershwins, Porter, Berlin, etc. "Many of them, like Porter's 'Night and Day' and Gershwin's 'The Man I love', had slow, half-spoken and now largely forgotten introductions that rambled on at some length before the real song got going. Irving Berlin's 'What'll I Do? ', for example, has one of these introductory or 'sectional' verses, muttering along for sixteen bars about the romance divine (''tis broken and cannot be mended'), like some dull sub-operatic recitative, before the familiar and brilliantly simple melody begins". This strikes me as showing a fundamental misunderstanding of the structure of such songs, within or without the shows for which many of them were written. They are thematic introductions whose relative unobtrusiveness prepares the way for the release of the song proper in the first stanza. Musically, some ('Night and Day', for example, or Hoagy's 'Star Dust') are quite complex and without them (and Ian Shircore is correct that they are now largely forgotten), the songs are usually poorer. Are they are all great? No, but many are to my mind an essential part of these great songs. I'll post this on the FB page, too. Thoroughly enjoyed Ian's book - it arrived the day after I'd gone on a week-long holiday, so I was quite keen to get home. I played the featured songs as I read each chapter, and the number of times I would get to a line in the text at exactly the same time as in the song was uncanny. I was amused to see that the almost legendary Patrick E Reinhardt (with the "E" omitted) has his own index entry, for his "close miked alto sax" on Dancing Master.